Recently I've had the feeling that George Orwell was on to something when he wrote 1984. The government is trying to distract us from the state of our economy, the lack of jobs and the men we still have at war by giving us feelies. Oh, we don't have actual feelies yet, unless you count that deal at Disney World where it feels like the mouse runs across your feet, but there is precious little real news out there and more of the "ah" stories. You know the "ah" stories. They are the sweet stuff about the cat who tracked its owner 1000 miles across country after being left behind in a move. Or the celebrity garbage that makes you think you're watching Entertainment Tonight instead of the national news. I don't know where to get news anymore. The same stories are repeated again and again on TV, on radio and apparently on the sites I haunt on the internet. Weekends are horrible because apparently all of these sites take a day off then and the stories are a repetition of the stories that are repeated during the week. I used to think Twitter was the answer but not really. I can find out about the presidential election in Egypt there, but I don't know really who is writing it. At various times, I've heard all of this is the fault of the liberal news media. Then I heard it was the fault of the one percent who own the media outlets. Let's not leave out the government who tries to keep things from us. Yeah , it does sound crazy. But the fact is, I still don't think we hear much actual news anymore. Having said all this, I have to state that I never wanted to write news. I think it's a truly difficult job. I've always held the opinion that there is no truly unbiased news just because news is written by humans who, by their nature, all have biases. We are writers. We should have the answers to this. So where do you get your news? While here on vacation in Wisconsin, almost every day I hear a story about missing fishermen who go out on a lake or river and never return. The searches are called off because of darkness or inclement weather, and resumed later. In some cases the bodies are found. In others, they’re presumed drowned and the bodies are never recovered. Sometimes I wonder, if someone had come to their rescue sooner, could they have survived? How long did they swim, waiting for help which didn’t arrive in time? Or, maybe, they hadn’t wanted to live, and didn’t want to be found. Or, maybe someone tried to do them in, by making adjustments to the motor so it would conk out, or siphoning off some of the gas. Or, maybe two of them got into an argument and one pushed the other over. So many grim possibilities. I wonder how often the true story ever comes out. Have you read any novels which include a missing person at sea or where a drowning is involved? Maybe you’ve written one yourself. Please share. My wife and I watch a number of true crime shows on TV. We have to. Otherwise, we’d be forced to watch dramas in which actors are chosen not for their talent but for the solidity of their abs. Or watch reality shows about people who repossess cars or fight over the contents of foreclosed storage units. I thought about auditioning for one of those shows until I read the requirements. You have to weigh more than 300 pounds and have at least 7 tattoos, one of which must cover 80% of one arm. And that’s only for the women. Requirements for men are even tougher. So we record Dateline, 48 Hours, American Justice and other true crime documentaries. Recording them allows us to watch them at our convenience and fast forward through promos for reality shows about repossessing cars and fighting over storage unit contents. True crime shows recreate real crimes committed by real people who are pursued by real investigators. They say truth is stranger than fiction. In many cases, that’s true. What is also true is that many of the cases we see are more ingenius and harder to solve than anything dreamed up by fiction writers. A recent case involved a woman initially hailed as a hero because she saved her own life and the lives of her three children one dark night by killing a home invader who beat and nearly strangled her to death. When police and EMT’s arrived, the poor woman was disheveled from fighting with her attacker and had marks on her throat from his attempt to strangle her. The invader turned out to be a mentally challenged young man well known to the family. In the young man’s car, investigators found a journal in which he detailed being hired by the woman’s ex-husband to commit the murder. Open and shut, right? No. Investigators felt something wasn’t right. The scenario of the woman’s scuffle with and eventual shooting of her attacker didn’t ring true. They also suspected someone had manipulated the young man into writing the journal. 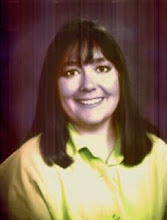 It took years for the truth to come out, but the woman was eventually indicted and convicted of first degree murder. She made a fatal mistake one day. She demanded the police arrest the man she’d divorced and charge him with conspiracy to commit murder. After all, she said, the journal clearly revealed he was behind the attempt on her life. Aha! The police had never revealed the existence of the journal or what was in it. The only person who could have known about it was the person who cleverly coerced the intellectually diminished young man to write it. That, along with other circumstantial evidence, convinced a jury that the fiendish and diabolical woman had carefully orchestrated the entire event, including inflicting strangulation marks on her own neck, to frame her ex-husband. Her sentence was life without the possibility of parole. I could never have dreamed up such a plot. That doesn’t mean I won’t fictionalize the events of that case, change names, places, dates, and other details, and come up with a story of my own. You could do the same, but don’t. I’ll sue. I had a conversation with a fellow writer recently about short stories versus novels. He wondered if people, because of the hectic pace of modern life, would be giving up reading novels in place of short stories. I thought no, that just the opposite would happen. People with busy lives would turn away from short stories. Neither of us have data to support our positions, so all of this is speculation. I reasoned this way. The novel is the only art form that cannot be consumed in one sitting. Anyone starting a novel knows they will put it down at some point and pick it up later. Not so a short story. Yes, you can put the story down and pick it up later, but I think that most people commit themselves to finishing the story once they begin. People with fragmented lives and smaller chunks of time for reading might be reluctant to open a short story if the probability of finishing is small. A novel, on the other hand, can be consumed in sips. There is no time commitment to finishing a novel. One simply reads while one can and resumes later. Writing a short story also takes a large commitment of time. I find that I will start a short story with the expectation of finishing it quickly. I usually won't begin a short story unless I have large blocks of time in which to write. Thus I think of short stories as vacation writing. Not because they are relaxing, but because I can tackle them without work or other commitments interfering. I write my novels on the other hand in the mornings before work and whenever I can steal time at my desk. I know the novel will be a long-term project, no matter how large or small the blocks of time for the project. I find that, page for page, a short story takes more time and effort than a novel. The reason is that every word has to count. Writing tight is not easy. A case in point is a short story I began last year about this time. I wrote it during a six-week period in which I worked at my job only four days a week, so large blocks of time were free to write. Getting the first draft was easy, but then I had to edit it. This particular short story is quite long. The first draft came in at 18,000 words, almost a novella. I had to cut it. After six drafts, I had it down to 12,000 words and I was pleased with the result. The story had good pacing, good character, good action, and tight writing. I queried an editor who expressed interest in the story. However, he wanted 10,000 words. If longer, he said, it had better be exceptional. I decided I would do both; I would shorten the story and I would make it exceptional. When you go from 18K to 12K, you get rid of most, if not all, of the fat. Trying to go from 12K to 10K, after all the fat has been cut away, is like polishing bone. After two weeks and two more drafts, I've manage to cut 600 out of the 2,000. Maybe I'll make it, but I suspect it will take me the rest of the summer. What's your experience with short stories? Do you read them? Do you write them? Do you prefer them to novels? 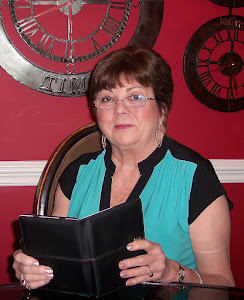 Game Face from Ilium Books, on Kindle, Nook, and other ebook readers. These are numbers 3 and 4 in the Rocky Bluff P.D. mystery series put out by another publisher who didn't stay in business for long. Recently, Oak Tree Press, who published the last 4 in the series decided to pick up the earlier books. These two are now available in all the usual places. 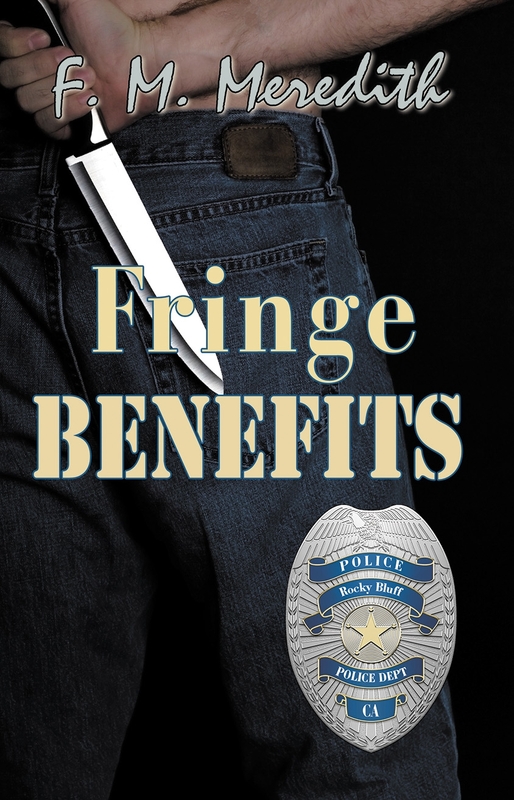 In Fringe Benefits a bad cop figures out ways the job will benefit him--even to the point of murdering his wife and getting away with it. (My cop son-in-law gave me the perfect method and no, he didn't use it to get rid of my daughter.) We once lived in a neighbor hood with several police families--one of the officers had some of the traits of the bad cop in this story. This is also the book where Officer Gordon Butler first appears. It is the beginning of his bad luck. Smell of Death contains two grisly murders and a missing child. It's also the beginning of the romance between Officer Stacey Wilbur and Detective Doug Milligan as they work together gathering evidence from all the crime scenes. This idea came from the same son-in-law who told me two things that bothered him about mysteries about cops in books, TV and movies. 1. The police detectives don't work on one crime at a time. 2. 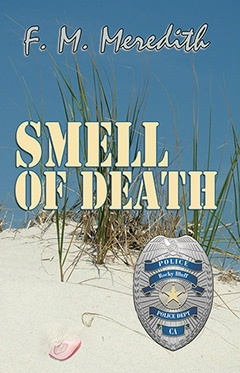 Nothing portrays how bad the smell of death is. Though I wrote each book in the series as a complete story, many of the characters reappear in each book. In fact, the whole reason I keep writing this series is I want to know what's going to happen next in the lives of the Rocky Bluff P.D. officers and their families. 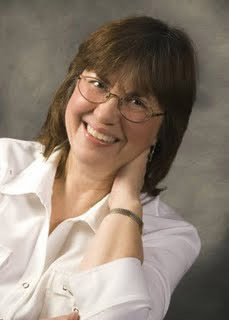 Mystery writer, Rita Mae Brown, once said that character comes down to one thing: "Survival alters ideology." As life buffets your characters they change and grow. Character grows from within, forced from without. I was reminded of this over the weekend as Tiger Woods won the Memorial Tournament with an amazing shot on the 16th. If you were to look for a living example of how fictional characters develop, look no further than Tiger Woods. In the first act of the Woods saga we meet a likable character from an unusual background--African America and Asian parents. The hero possesses some unusual talents that people are beginning to recognize. In this case, he can swing a golf club like no one else. At the end of the first act, our hero sets off on a quest to capture the title of greatest golfer of all time. He has to win more tournaments than Jack Nicklaus to do it. The story question is, "Will Tiger Woods capture the golfing crown from Jack Nicklaus?" In the first half of the second act, our hero wins tournaments, some of them with remarkable shots and spectacular play. This is the learning half of the second act when everything appears to be working according to hero's plan. He encounters obstacles of course, some of which have nothing to do with golf, but with race. He faces many opponents who try to stop his quest, but he defeats them all. He becomes stronger with each obstacle he overcomes. Along the way, he acquires supporters who provide him with the resources he needs to continue. In the middle of the second act comes a high point and a crisis. He wins his greatest victory, the U.S. Open, while playing with a torn ACL and a broken leg. At this point, he appears unstoppable in pursuit of his goal. Then comes the second half of the second act. The rug is pulled out from our hero. His fall is spectacular. The catastrophe is the result of his own making. Some of the things he did in the first half of the act, which everybody ignored, now come back to ruin his plan. He loses everything--his wife and children, his allies, his confidence, and his abilities in golf. At the end of the second act, our hero is down, his plan is in total disarray. He himself is in disgrace and the object of jokes by late-night comedians. At that point, when the curtain falls on the second act, the answer to the story question is "No." All great stories have a third act. Now the hero must pull himself up and fight harder than before with fewer resources. The opponents are tougher because they have been strengthened in the previous fights. He has to relearn his skills and refashion them for the new circumstances. Tiger Woods struggles through some tournaments, coming close in some, not even making the cut in others. He suffers through the worst losing streak of his career. In the third act of a story, the hero must storm the castle to achieve the final victory, so it is highly symbolic that he goes to the Memorial, which is Jack Nicklaus's tournament on Jack Nicklaus's own course, and wins it in stunning fashion to tie Jack Nicklaus for the number of tournament victories. Life is not art, even though it seems to imitate it in this case. We don't know how Tiger's story will turn out, or whether there will be more acts in his story. I find Tiger's story inspiring, not for how to live my life, but for how to punish my own characters to make them come alive on the page. When I'm struggling with a sagging middle to my story, I ask myself "What would Tiger do?" When I'm pulling the rug out from under my characters, I ask, "How hard would Tiger fall?" As Rita Mae Brown said, "Survival alters ideology." We writers have to force change on our characters by stressing them out. Tiger's story shows that the more we stress them, the greater the change. 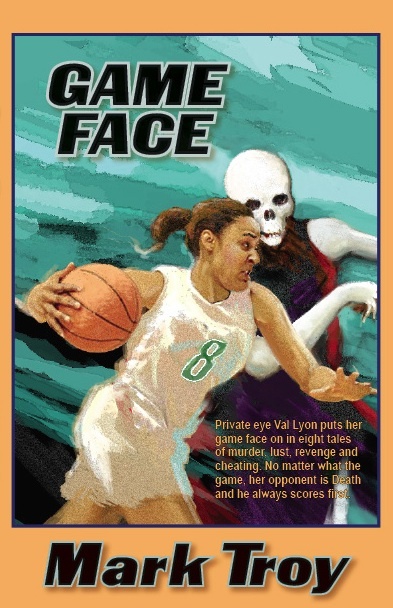 Game Face, the collection of Val Lyon Mysteries, on Kindle and Nook. 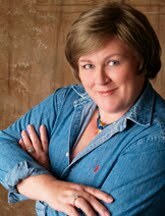 I've done hundreds of bookstore signings all around the country since my first Greg McKenzie mystery came out in 2002. I've attended dozens of mystery conferences and conventions where I sat at a table hoping someone would come along with a book to sign, but I don't recall a store event when I didn't sell a book. There have been some where the number was terribly few, but many others have produced a decent amount of sales. I've noticed a change in the climate over the past couple of years. Fewer bookstore patrons seem interested in trying a new author they're unfamiliar with. And working closely with my current small press publisher, I've learned more about the industry's problems. Like when a store orders twenty copies and the author sells only ten, returns decimate the profits. As a result, I have just about stopped my bookstore signings. I can make more money and avoid the returns problem by concentrating on festivals and fairs and similar events. 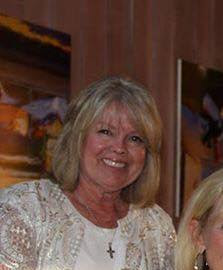 So far this year I have done a library author day, the Southern Kentucky BookFest, Franklin (TN) Main Street Festival, and Cool Springs (Mall) Festival of Art, Music and Books. Upcoming are the RC Cola & Moon Pie Festival, Horse Cave (KY) Bookfest, Gallatin (TN) Main Street Festival, and Kentucky Book Fair. I'll add others as the opportunities arise. I find people at events like these more willing to try new authors, and happily I've had an increasing number of readers stop by to add more of my books to their collections. Although the book fairs usually will order your books for the event, I volunteer to bring my own, thus avoiding the problem of returns. Since I've made all of my books available as ebooks, I'm selling a lot more online than on paper. And though I price my books low, with Amazon and Smashwords' royalty rates, I still come out okay. I suppose this is part of the changing paradigm of the book business. I do a lot less traveling and spend less on book promotion. I remember back in my early days I kept hearing that you should break even on your fourth book. Now that I have eight out, I can assure you it ain't necessarily so.